Book Review by Wayne Handlos, Ph.D.
by Anne Wilkinson, 2007, Sutton Publishing Ltd.
research that went into this book, it will remain an important source of information for years to come. done but strict chronology suffers. boxed insets. Some of this last type are less than useful and should have been rejected by an editor. like an unwinding detective story. She also tells us something about the first illustrations of some of the species (P.
triste in 1635) and gives us a first hand look at some of these illustrations and the people who made them possible. Pelargoniums in England. That in itself is a complex and interesting (and sometimes rumor-laden) story. who were interconnected in the story of Pelargonium. saw a decline in the number (and to some extent the quality) of illustrations of the plants being grown. (the 'oculated', eyed or phlox types of flowers, very double zonals, the New Life or striped flower types, green flowers and rosebuds). of the Bruant 'grand bois' plants which were more tolerant of sun and difficult growing conditions than the zonals which preceded them. flowers and bird' egg varieties were developed. Australia. No mention is made of contemporary commercial breeders and breeding programs in various countries. leaf Pelargoniums but barely scratches the surface. book and helps us understand what is included in the various groups mentioned in the text. published the one American entry lies in its death throes. quirky pattern. An editor should have overruled her. 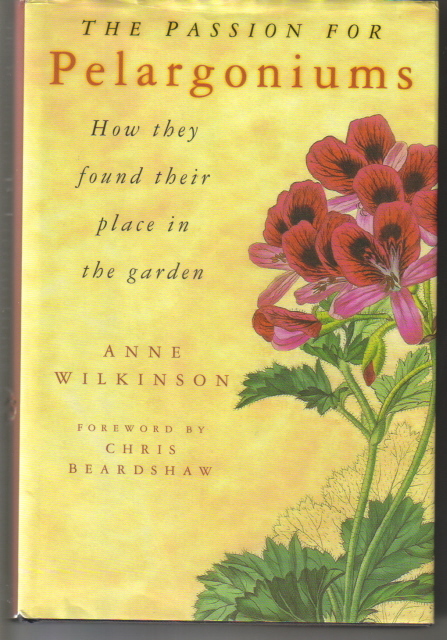 this is A book about Pelargoniums but it is not THE book about Pelargoniums.